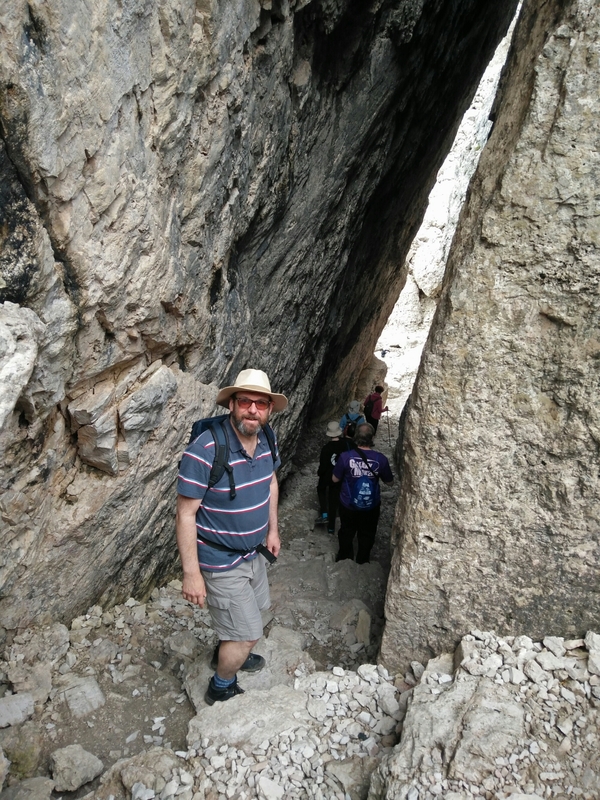 Today I was mainly occupied with a hike to the Cinque Torri, a group of five towering peaks about 12 km from Cortina d’Ampezzo. It wasn’t too strenuous, although the recent rains had made some of the trail a bit slippery. The route we followed included a visit to trenches, gun emplacements and other fortifications built during the First World War. There was heavy fighting in this area, because it was the border between Austria and Italy at that time. It must have been very grim for the soldiers dug in above the tree line, especially during the winter. Anyway here’s a quick snap of me abour to pass through a gap in one of the rocky structures at the peak, just before we started to descend.